Issue: Are Evolutionary Explanations a Good Foundation for Understanding Morality? Patricia S. Churchland argues that morality can best be explained in terms of evolutionary theory. She asserts that brain chemicals, such as oxytocin and vasopressin, are responsible for social bonding in mammalian species. These nonapeptides cause individuals to treat others in various ways such as protecting them from pain and desiring to keep them healthy. Churchland calls these sorts of feelings and behaviors “other-care.” Because human beings learn sociability through observation and problem-solving, Churchland claims that morality is based on a group’s understanding of sociability. Many cultures have the same moral and ethical principles (e.g., don’t kill) due to the human race’s evolutionary roots. 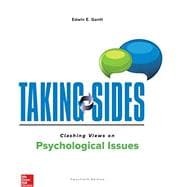 Prepared specifically for this edition of Taking Sides: Clashing Views on Psychological Issues, Edwin E. Gantt refutes the notion that evolutionary psychology is the best way to explain the development of morality. He argues that if this way of accounting for behavior is true, then every action we take is determined by our biology and its interactions with the environment, and, thus, our moral sense becomes only the experience of an illusion. He states that evolutionary psychology itself rests on a self-nullifying argument as our moral desires and sensibilities would be based only on reproductive success and not on the rational search for truth. Gantt describes previous research that shows how an individual’s views on morality and free will affect their choices and argues that the way we view our world and the essence of morality affects how we act toward others. Issue: Is Homosexuality Biologically Based? Neuroendocrinologist Jacques Balthazart argues that the prenatal endocrine environment has a significant influence on human sexual orientation and that genetic differences affecting behavior, either in a direct manner or by changing embryonic hormone secretion or action, may also be involved in determining life-long sexual orientation. Professor of psychology Stanton L. Jones and clinical psychologist Alex W. Kwee claim the current research on the biology of homosexuality provides no firm evidence for biological causation and leaves room for learning models of sexual orientation. Issue: Is Free Will an Illusion? Arnold Modell, a clinical professor of social psychiatry at the Harvard Medical School, argues that our sense of agency, or conscious will, is actually an illusion created by the functioning of the brain. However, he claims that even though our sense of personal agency is an illusion, it is an important illusion—one that is necessary for our existence and mental health. Eddy Nahmias, a professor of philosophy at Georgia State University, takes an opposing view against those that see free will as an illusion—a view increasingly common in psychology. He argues that one does not simply have to accept the conclusion that free will is simply an illusion because fMRIs show neuron firing a split second before a choice is made. In other words, he argues that brain activity is not sufficient to account for conscious human actions. Issue: Is American Psychological Research Generalizable to Other Cultures? Gerald J. Haeffel and his colleagues believe that psychological studies of American people often generalize to people of other cultures, especially when basic processes are being studied. Jeffrey Jensen Arnett, a psychological research professor, argues that culture is central to the functioning of humans and thus to psychological findings. Issue: Are Traditional Empirical Methods Sufficient to Provide Evidence for Psychological Practice? Issue: Is Psychology a Science? Robert E. Silverman, an academic psychologist writing in Skeptic Magazine, presents a brief history of psychology and a few of its main figures while addressing the role of science in psychology. He argues that over time psychology has become more scientific (i.e., more objective in observations and measurement). He concludes that as the current partnership of psychology and neuroscience grows stronger, there will be no question that psychology is indeed a science. Peter Rickman, formerly professor of philosophy at City University in London, argues that psychology is not a science like physics and other natural sciences because although it shares certain aspects of the scientific method, it must and does rely on the methods of hermeneutics. He argues that because observable facts are not the data being studied in psychology, but rather meaningful communication, psychology must always consider context and background in its research. The scientific method is not sufficient for psychology to accomplish this task. Issue: Are Violent Video Games Harmful to Children and Adolescents? Issue: Does Parent Sexual Orientation Affect Child Development? Peter Sprigg of the Family Research Council recapitulates the arguments and findings of Mark Regnerus, concluding that the idea that children of homosexual parents are no different than children of heterosexual parents and, thus, are unharmed by the gender of their parents is a myth. Attorney Carmine Boccuzzi and colleagues, critiquing that the methods and findings of the Regnerus’s study and other similar studies, argue that children of homosexual parents are just as well off as children of heterosexual parents in most aspects of life. Issue : Can Positive Psychology Make Us Happier? Positive psychologists Stephen M. Schueller and Acacia C. Parks present a summary of the current state of positive psychological interventions as they pertain to self-help, interventions that have been shown to lead to increases in individual happiness. Psychologists Laurel C. Newman and Randy J. Larsen challenge the external validity and sustainability of the effects of these strategies, arguing that most of what influences our long-term happiness is outside our control. Issue: Is Emotional Intelligence Valid? Psychologists John D. Mayer, Peter Salovey, and David R. Caruso maintain that some individuals have a greater emotional intelligence, a greater capacity than others to carry out sophisticated information processing about emotions. Psychologists Gerald Matthew, Moshe Zeidner, and Richard D. Roberts contend that the concept of emotional intelligence, as currently understood, is fundamentally flawed, having no reliable foundation in biological, cognitive, coping, or personality models of human behavior. Issue : Is Attention-Deficit Hyperactivity Disorder (ADHD) a Real Disorder? The National Institute of Mental Health asserts that ADHD is a real disorder that merits special consideration and treatment. Sami Timimi and Nick Radcliffe insist that ADHD is not a medical disorder as it has no demonstrable biological cause; rather, it is not a disorder at all, but an agenda-driven, socially constructed entity invented by Western society. Issue: Is Addiction a Disease? The National Institute on Drug Abuse describes drug abuse and addiction as a disease of the brain. Although initial drug use may be voluntary, the resulting physical changes to brain circuits explain the compulsive and self-destructive behaviors of addiction. Environmental and genetic factors explain why some become addicted more readily than others. Journalist and author Peter Hitchens argues that because the disease model of addiction is deterministic, it fundamentally misunderstands human nature and the ability people have to make meaningful choices regarding how they are going to live their lives. Issue: Are Psychiatric Medications Safe? Robert H. Howland argues that although medications may be dangerous in some situations, the history of psychiatric pharmacology has demonstrated the actual benefits from the medications outweigh the potential harm. Gary G. Kohls, a retired physician, argues that many of the “facts” about psychiatric medications are myths, questioning the effectiveness and safety of their use. Issue: Are All Psychotherapies Equally Effective? Psychologists Mark A. Hubble, Barry L. Duncan, and Scott D. Miller argue that all effective therapies are essentially alike, while all ineffective therapies are ineffective in their own way. In addition, while many different psychotherapies are effective in relieving the suffering of patients, all of these therapies are effective because of the factors they all possess in common, not for any unique belief or procedure a therapy may possess. Psychologists Jedidiah Siev, Jonathan D. Huppert, and Dianne L. Chambless assert that outcomes among the various psychotherapies differ primarily because one technique or therapy is better than another. Issue: Should Therapists Be Eclectic? Counseling psychologist Jean A. Carter insists that the continued improvement and effectiveness of psychotherapy requires that techniques and theories include the different approaches of psychological theory and practice through an eclectic approach. Professors of psychotherapy Don MacDonald and Marcia Webb contend that eclecticism creates an unsystematic theoretical center for psychological ideas and methods that ultimately limits overall therapeutic effectiveness. Issue: Can Psychotherapy Change Sexual Orientation? Joseph Nicolosi, A. Dean Byrd, and Richard W. Potts surveyed a large number of individuals who self-identified as homosexual—both before and after receiving conversion therapy—to determine whether the therapy was an effective means of changing sexual orientation. PAHO asserts that there is no scienti?c evidence for the effectiveness of sexual reorientation efforts, and that efforts aimed at changing non-heterosexual orientations lack medical justi?cation. The PAHO statement views “conversion therapies” as threats to personal autonomy and to personal integrity. Issue: Is Gender Identity Biological? Aruna Saraswat, Jamie D. Weinand, and Joshua D. Safer review empirical studies that suggest gender as biologically caused. They discuss congenital adrenal hyperplasia, gray and white matter studies, and twin case studies as evidence for their argument is that gender has a biological basis. Michael J. Carter explores a review of the literature that emphasizes gender identity as being based in learned roles. He discusses how gender is learned over time in the family environment and how gender can be a person identity, role identity, or social identity in gender identity theory. He argues that gender comes from learned roles in society. Issue: Is Marriage Uniquely Important? Galena Rhoades summarizes research findings that indicate that stronger and more enduring marital relationships, and better mental health outcomes, occur when people make conscious decisions to commit to another person in a marital relationship rather than “sliding into” a marriage as the result of a progressive development of cohabiting. Brienna Perelli-Harris and Marta Styrc argue that marriage affords no benefits over cohabitation in most circumstances. Their results indicate that when controlling for childhood characteristics, living with a partner increases well-being, but the type of relationship (marriage vs. cohabitation) does not matter. Issue: Is Excessive Use of Social Media a Form of Narcissism?